The always seeking and usually wishful-thinking theologian Frederick Buechner had much to say about Good Friday in the his book, Faces of Jesus. He wrote, "To participate in the sacrificial life and death of Jesus Christ is to live already in his kingdom. This is the essence of the Christian message, the heart of the Good News, and it is why the cross has become the chief Christian symbol. A cross of all things – a guillotine, a gallows – but the cross at the same time as the crossroads of eternity and time, as the place where such a mighty heart was broken that the healing power of God himself could flow through it into a sick and broken world. It was for this reason that of all possible words they could have used to describe the day of his death, the word they settled on was 'good.' Good Friday." So maybe there is good news on Good Friday. But how? How can we find ways to “participate in the sacrificial life and death of Jesus” as Buechner suggests? The vergers at our parish may have found our way. A long-standing tradition at Christ Church is known as "Vergers Keeping Watch." Immediately following the noon Good Friday Liturgy, the Cathedral Vergers (usually two to three souls) hold the front doors of the nave open to the city of Nashville for prayer and reflection until 3:00 p.m. This has been an extremely rewarding experience for the participating volunteer vergers as we are able to silently reflect on the meaning of the day. Many curious visitors, as they slowly trickle in and out of the church, experience the afternoon in their own quiet ways. Precisely (and we vergers all know what "precisely" means) at 3:00 p.m., we stand in the 9th Avenue Narthex, at the door, looking out, as we toll the tower bell thirty-three times. Why thirty-three times? Because that is the customary age Jesus is believed to have been when he died. According to Luke 3:23 he was about thirty when he began his ministry and John mentions three Passovers during his ministry which brings him to the age of thirty-three. So the bell tolls to honor each year of his life. In years past, Good Friday was the only time that the Cathedral bell was rung. According to Geoffrey Butcher, retired Canon Pastor who began the tradition many years ago at Christ Church, "Hearing the bell may have made some people realize that the church had an active ministry in the early days. I talked with people who thought that the church was an abandoned building but the tolling bell on Good Fridays told them otherwise." 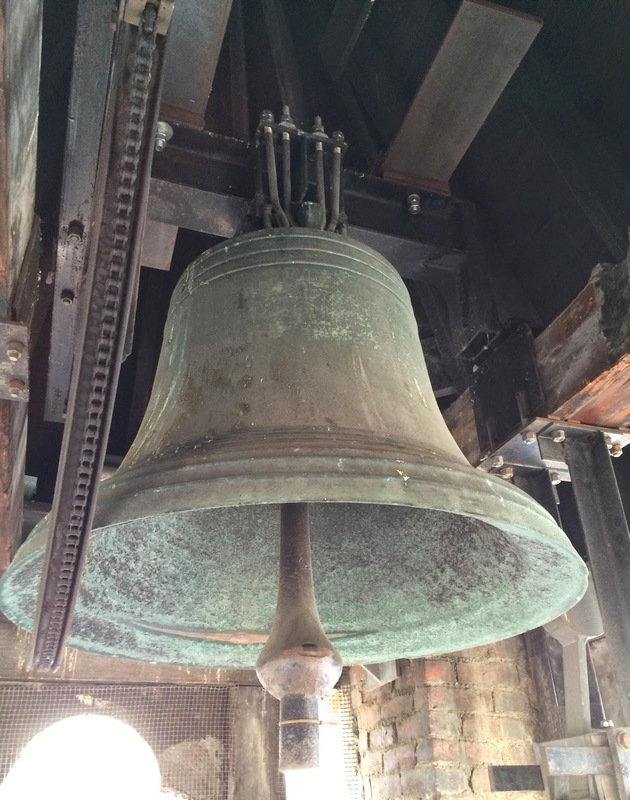 The Good Friday bell ringing leads to questions about the history of the tower bell itself. Where is it? How long has it been there? Fletch Coke, Christ Church Archivist and historian recently explained, "The ladies of the church were busy indeed during the summer of 1833. The rector reported that the ladies had sold "articles made chiefly by themselves, for the purchase of a bell." With the $650.00 raised they purchased a bell. In the tower of old Christ Church located on Church Street, the bell was hung in the spring of 1834 where it remained for the next 55 years. After the sale of the old church, the bell was removed and re-hung in the "new" belfry in 1891 on Broadway. That bell tower is the smaller tower at the southeast corner of what is now the Parish Hall. At a Jumble Sale at Christ Church in the summer of 1996, sufficient funds were raised to purchase an electronic system for ringing the bell. On All Saints Sunday, November 3, 1996, the historic bell at Christ Church once again pealed forth calling the faithful to worship." Rev. Butcher added, "...on one Good Friday, I went to ring the bell at 3:00 p.m. At that time, an old rather fraying rope was attached to the bell clapper. After climbing the steps, grasping the rope, and ringing the bell a few times, the rope broke and I went sailing backwards down the old rickety staircase. Not to be outdone, however, I got up, climbed the stairs, and with my hands, tossed the heavy clapper at the bell until I had rung the bell 33 times. After that event we thought that we should look into updating the way the bell was operated. That turned into a big project resulting in the ability to ring the tower bell automatically." In a subsequent event in 2011 on Good Friday, the electronic system for ringing the bell malfunctioned and would not operate. On that day, the vergers coordinated with Elliot Brown, Cathedral Maintenance Engineer, to hold watch in the belfry with a cell phone and a hammer. When his cell phone turned to exactly 3:00 p.m., Elliot, along with his trusty assistant Trent, dutifully tolled the bell manually, bong... bong... bong... with the knowing smiles of vergers down on the street. Where there is a will, there is always a way! That's how we vergers operate. So, as the vergers and others stand at the steps on 9th Avenue and Broadway in Nashville, at 3:00 p.m. on Good Friday this year, holding the small grey remote control that tolls the bell slowly, gazing at our verger watches synchronized to the atomic clock, at the moment that Christ died some two thousand years ago, significant history and tradition will live through our own actions while celebrating the life of the dear one, the savior who died for us. We might also trust that the healing power of God will continue to flow through into our sometimes troubled world, making this truly a very "Good" Friday. Abstract: The Verger's Voice blog is taking this week off in order to worship and serve in our parishes during Holy Week through Easter. This post is a repeat of the one used last year on this day. We will be back in full operation next Friday.